Chai Spice mix is a dry spice blend mix used to prepare the popular Indian tea, masala chai. Instead of using whole spices to prepare the tea, you save time by adding the finished chai spice mix to the cooking milk with tea leaves. 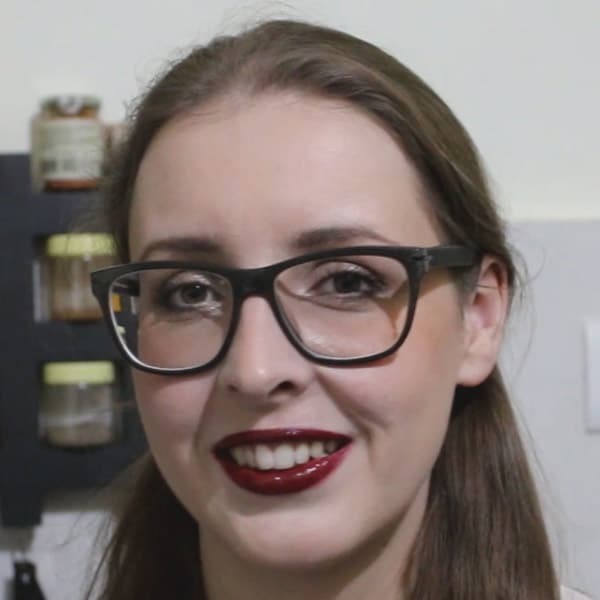 Further below I share my knowledge about the spices used, some tips and chai spice mix variations and further uses. 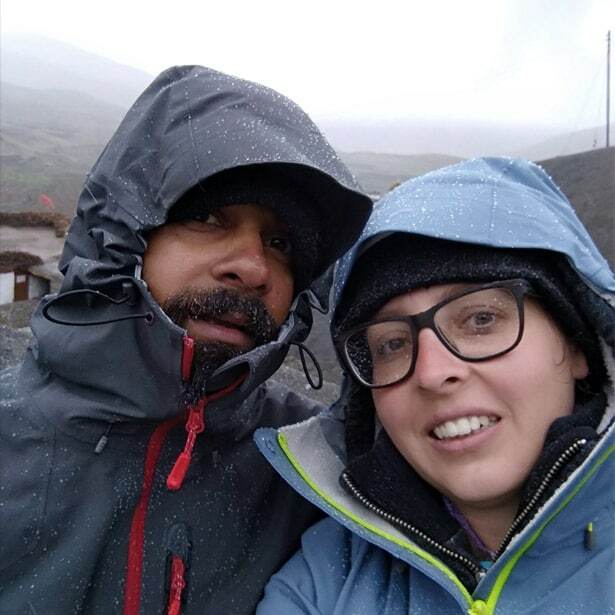 What is Chai and a Masala Chai? What’s the difference? Chai means Tea in Hindi (major Indian language) and it’s mostly associated with milk tea because milk tea is just super common in India. Masala Chai is basically regular milk tea (chai) enhanced with spices during the cooking process. Masala means a blend of spices. The regular Chai is the most common version of tea that you would encounter if you travel across the Indian subcontinent. Masala Chai is more common in some places than others. However, while masala chai can still be found in most regions in India, it always varies in flavor. Basically, there is not one and only spice blend for masala chai. Masala Chai is mainly prepared with whole spices, however, masala chai spice mix (such as the one I’m sharing today with you) have picked up since recent times due to the fact that they can be easily added to the cooking milk and tea to prepare a quick masala chai. 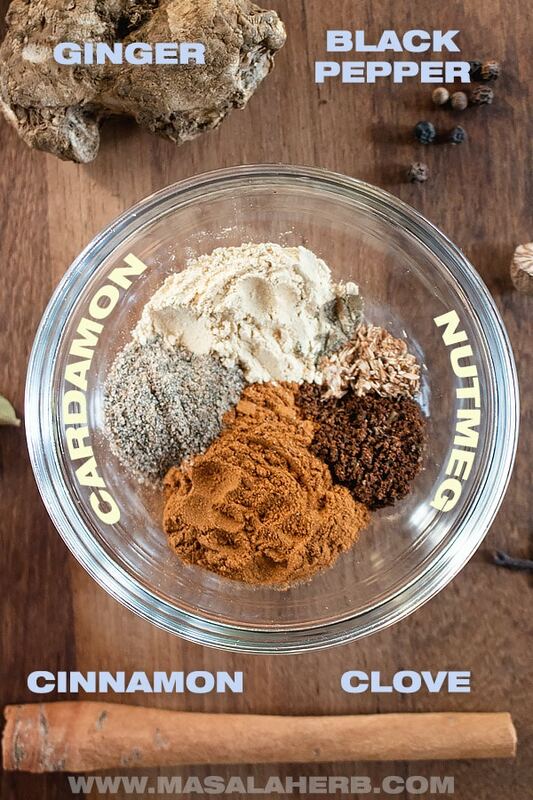 To prepare this chai spice blend, you will need a few common ground spices. Chai Spice blends can be adjusted with more spices to add more aroma to your spiced milk tea. However, these are the basic 6 spices: Cinnamon, Clove, Ginger, Cardamom, Black Pepper and Nutmeg. Cinnamon is soothing and a comforting autumn/winter spice. The smell and taste of this amazing spice has the ability to instantly relaxing our body in mind. Cinnamon is definitely the star of any chai spice blend, in fact, it’s also the main ingredient in a similar spice blend, the pumpkin pie spice mix. Cloves have a numbing effect when chewed on them and they are my all-time favorite fall spice. In the Chai spice mix, clove powder acts as a bridge between the other spices, rounding up the aroma experience somewhat. Cloves are also great for your health because the spice can strengthen your immune system. The Ginger root adds not only prickly flavors to the chai spice but also some interesting health benefits. Ginger is known to work against the flu and keep a cold away. In India, Ginger is extensively used in other tea variations as well besides the milk chai, as for example in the healing Ginger Lemon Honey Tea. The Green Cardamom is the queen of spices because it’s unique and so very complex in flavor. Black Cardamom is from the same plant but for this recipe, you will need only the green cardamom pods. If you happen to have only whole pods, you will have to grind them to very fine to a powder. Cardamom is one of the major flavor giving spices in a masala chai spice. Only a tiny amount of Black Pepper is used in the Chai spice blend to add that slight prickly touch to the tea when you take a sip. Use a pepper mill to grind the whole peppercorns. Black Pepper is great when you have the flu. The moment you smell the powder, I will guarantee you that you will sneeze. The sneezing, in turn, will free your respiratory system. So, black pepper in a chai tea can only be a plus point as you can see! Nutmeg is a spice that relaxes. The nut is scraped with a fine nutmeg grater or you can use a small kitchen knife too to carefully “grate” off the semi-hard aromatic spice. Only a small quantity is ever used of nutmeg because it’s flavor is rather strong and because a very large dose of nutmeg can be hallucinogenic. Although seriously you would have to consume a massive amount of nutmeg for this to work. Nutmeg is usually commonly used to flavor soups and sauces. Star Anis – Just a small amount of the spice is enough to add a licorice touch to the chai blend. It’s my secret chai spice ingredient. Fennel Seeds – Can also add a licorice edge to the chai spice but in a different way. Red Chili Pepper – A pinch to just add the little prickling effect. I frequently add chili pepper to spice up things. How to turn whole spices into powder? For the Chai Spice mix, you can grind your own whole spices to a powder. You will need a small pan and a grinder or a Mortar and Pestle. Then, pan dry toast/fry the whole spices just for about 30 seconds on medium heat. This releases the aromatic oils and makes them crispy and easy to grind. After that leave them to cool. Next, grind them all to a small powder. I tend to grind one spice at a time, it’s easier that way. For the Cinnamon or other very hard spices, I recommend using a super sturdy tough grinder with the proper spice grinder jar. Weak grinders won’t be able to grind the cinnamon and it will break the blade. Otherwise just use store bought cinnamon powder. How to store the Chai spice blend? Store the Chai spice blend in glass spice jars so that you can see it easily. That will prevent you from forgetting about your spice blend and you will use it automatically more often. At the same time, glass jars are great because they keep the humidity away and you are better organized that way especially if you use something like a retractable bamboo spice rack. I keep my spices in glass jars too but my husband built me a minimal and straightforward wall rack where I can pop each jar into the rack. It’s on eyesight so I can’t really miss anything and at the same time, it saves counter space. 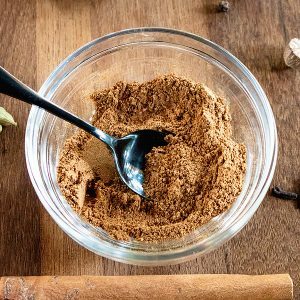 Chai Spice Blend to prepare Indian Masala Chai Tea or chai spiced dessert treats. Make it and store in an airtight container, see storage suggestions in the post. For a high-quality spice blend use premium organic whole spices and grind to a powder (+refer to post on how to bring out the spice aroma). 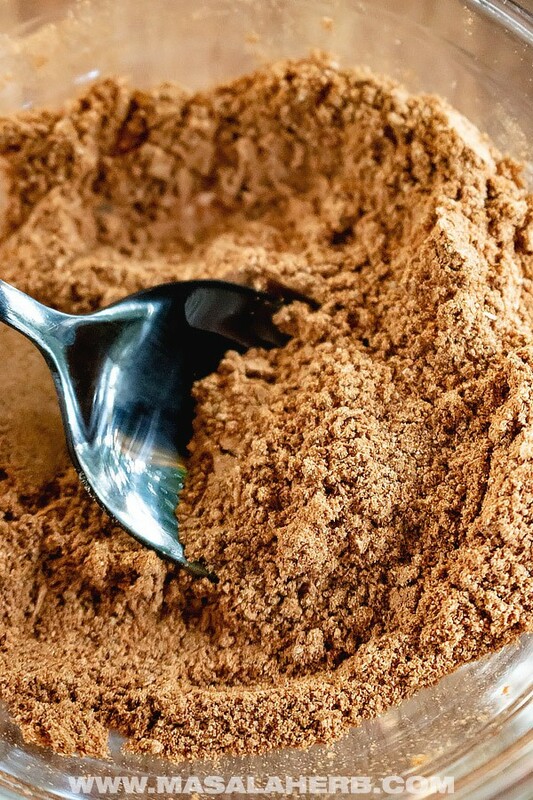 For a quick and easy budget chai spice mix, simply use a powdered version of each spice and mix it together. 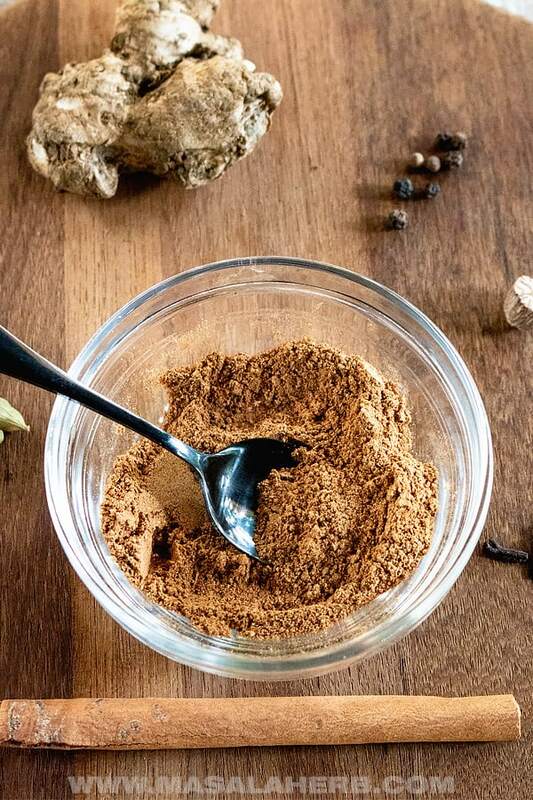 This Chai spice mix recipe is for a small quantity. You can double the recipe to make more and to keep. For the best spice blend experience, grind fresh and use directly. The longer spices sit our the more they lose their aroma. 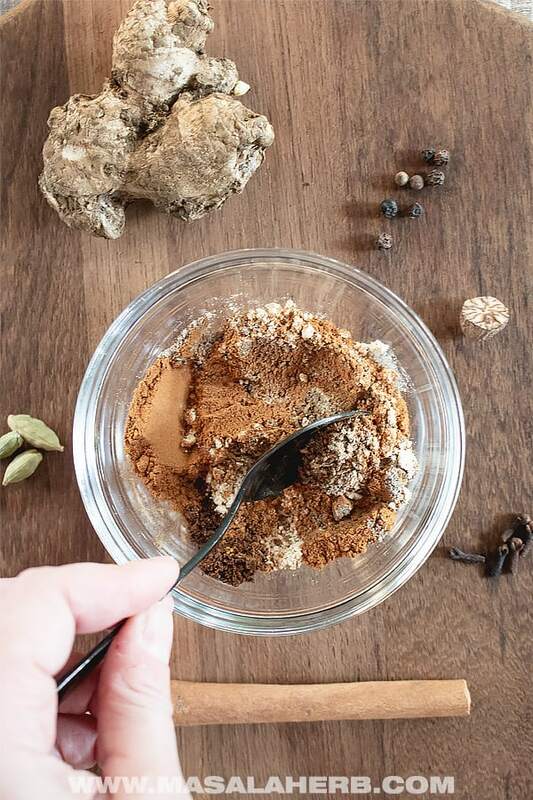 Dear Reader, How are you going to use your own DIY Chai Spice Mix? Hi, this may be interesting you: Chai Spice Mix Powder!